Join the Inns of the Gettysburg Area the first Saturday of every April for a celebration of Abraham Lincoln and his time in Gettysburg. Meet at the National Cemetery at 1 PM for a walk with a Licensed Battlefield Guide as he tells the story of how the cemetery came to be and the visit paid by President Lincoln on November 19, 1863 when he delivered one of the most famous speeches in American history. 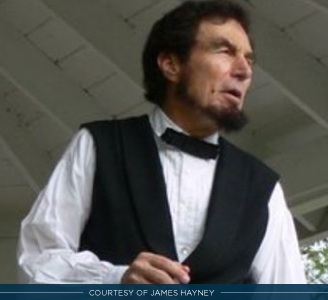 At 6:30 pm, we will meet at the Dobbin House for dinner with President Lincoln (James Hayney), followed by reminiscences from the President. Entrée choices: Salmon, Prime Rib, or Hunter-style Chicken (chicken breast with mushroom sauce). The cost is $55 per person ($40 for children under age 12) per person and includes the walking tour, dinner and evening talk at the Dobbin House.